Gluten-Free Funfetti Cake Makes a Perfect Birthday Cake! This delicate yellow cake recipes–that’s bursting with sprinkles–only requires one bowl to make. It’s perfect for beginner bakers. Finish the cake with vanilla buttercream frosting–and more sprinkles, of course! When a reader left a comment asking for a funfetti birthday cake, I could not wait to make it. For some reason, I’ve made easy gluten-free funfetti cupcakes. They’re really easy and only make 12 cupcakes. And I’ve made a “just like the box” gluten-free funfetti cake. That recipe is a Saturday baking project. It uses individual gluten-free flours and requires you to cut in shortening–not a hard task but one that takes some time. This recipe is quick. 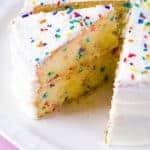 It makes a perfect two-layer cake —which is what you want for birthday parties or any other time you want SPRINKLES! If you aren’t familiar with funfetti, I’m about to make your day! 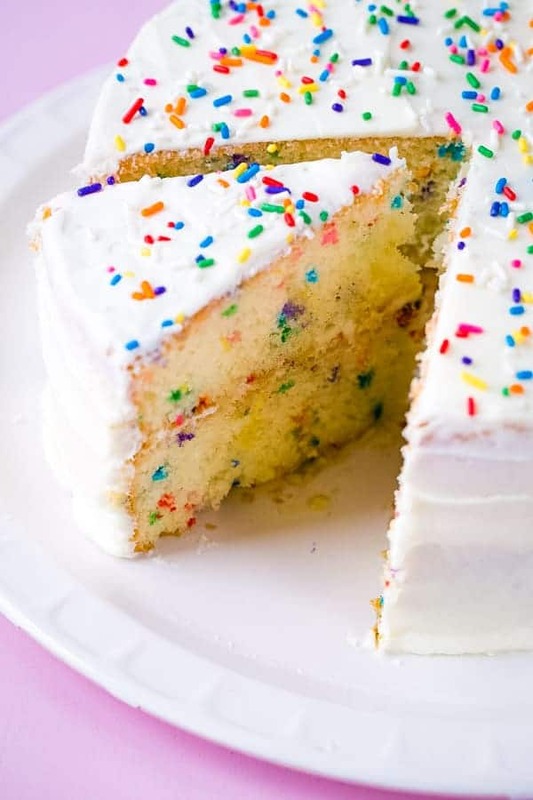 Funfetti is white cake with sprinkles. Lots of sprinkles. Pillsbury is the creator of the funfetti phenomenon. They introduced it in 1989. And the rest, as they say, is history. 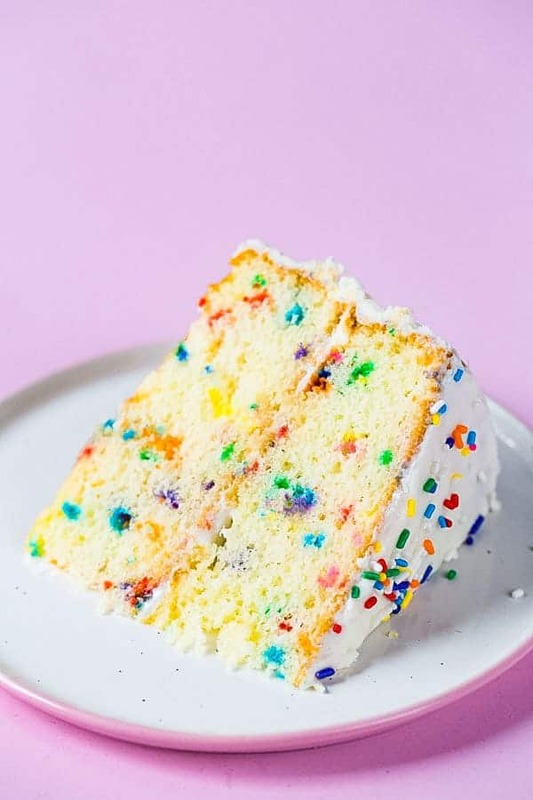 What’s the Best Gluten-Free Flour to Use for Funfetti Cake? For this recipe, use a gluten-free flour blend that contains xanthan gum. Without it, the cake turns out flat and dense. I tested the recipe with Bob’s Red Mill 1:1 Gluten-Free Baking Flour. If your flour blend doesn’t contain xanthan gum, add 1 teaspoon to the recipe. There’s a lot of debate around this. 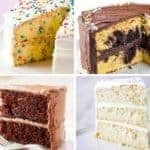 I believe that the unique funfetti flavors comes from a combination of clear vanilla extract and a dash of almond extract. It’s funny that I call for clear vanilla extract. If you’re familiar with vanilla, you know that clear vanilla is artificial vanilla. And that’s the point. Boxed funfetti cake mix, the type you probably grew up eating, includes artificial vanilla. If that’s the flavor you crave, grab a bottle. It makes a difference! I’d use clear vanilla extract in my frosting too, for the full effect. As for the almond extract, it adds an almost maraschino cherry flavor. (If you’re just realizing that maraschino cherries taste like almonds, raise your hand, girlfriend.) The almond extract isn’t required. Feel free to skip it if you don’t want to buy a bottle. Why Make Funfetti Cake from Scratch? Can’t I Use a Mix? You sure can! The reason I prefer to make it from scratch is a simple one: taste. I think that homemade cake tastes better. Plus, when you make it from scratch, you can tailor the ingredients to suit any other food allergies you or your loved ones deal with. Prepare the Batter. This is an easy one-bowl recipe. Whisk together the dry ingredients, add the eggs, oil, and flavors. Stir. Done! 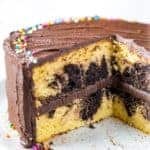 Pour batter into greased cake pans. Cool. <–this is key. 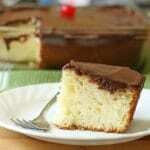 If you frost a warm cake, the frosting melts and drips down the cake. It depends. 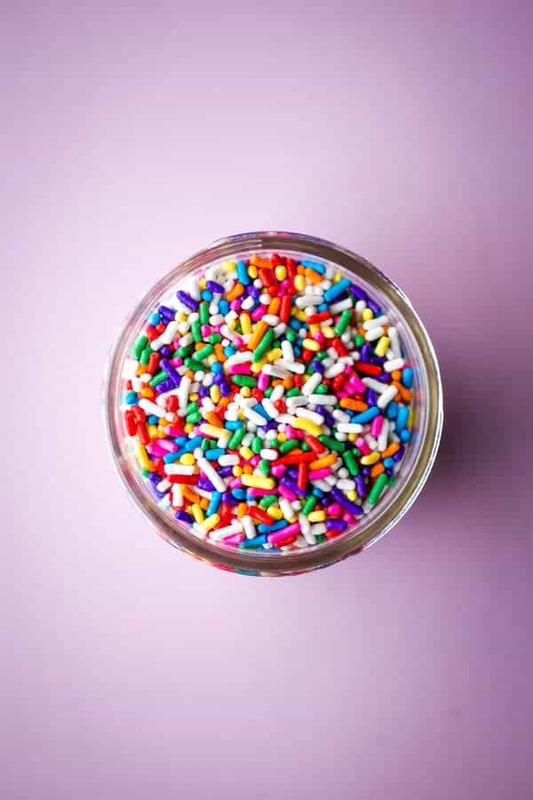 Most sprinkles (also called Jimmies) are gluten-free. However, you should always read labels. What Kind of Sprinkles Should I Use for Funfetti Cake? Good question! There’s lots of sprinkles on the market. For funfetti cake, I use “sprinkles”, they are also labeled jimmies. Don’t confuse these with nonpareils. “Sprinkles” are long and soft. Nonpareils are tiny, hard sugar balls. In batter, nonpareils tend to melt and bleed color, while sprinkles don’t–giving you nice bursts of color throughout the finished cake. You can finish funfetti cake with any frosting that you love! Classic vanilla buttercream frosting is traditional. But I think chocolate and cream cheese also make nice frostings for funfetti cake. 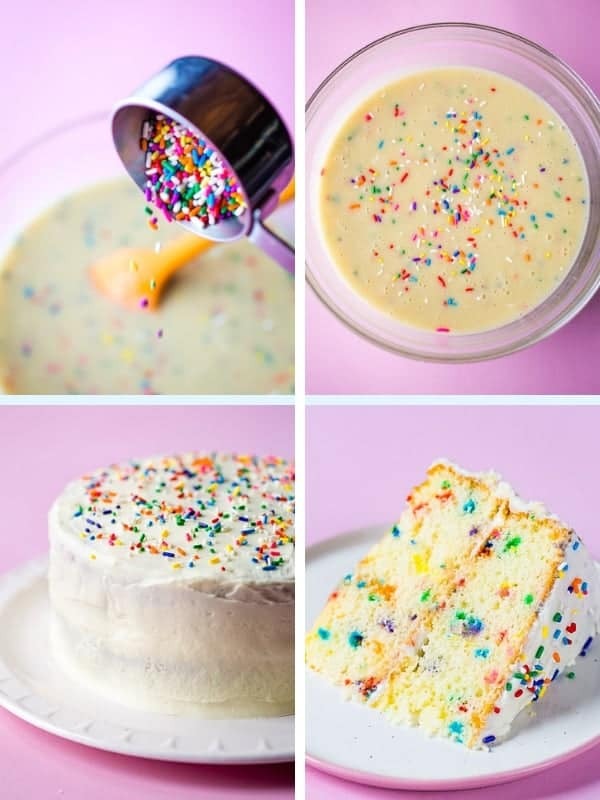 Easy gluten-free funfetti cake. Loaded with sprinkles, this tender cake makes a fun birthday cake--no mix needed! Preheat oven to 350 degrees F. Grease two 8-inch round cake pans with nonstick cooking spray. Whisk together gluten-free flour, sugar, baking powder, and salt. Add milk, oil, eggs, and extracts. Whisk until a smooth batter forms. Add 1/3 cup sprinkles. Stir to combine. Bake until cake is golden brown and a cake tester inserted into the center of the cake comes out clean, about 30 minutes. Remove cakes from the oven and place on a wire rack to cool for five minutes. Then turn cakes onto the wire rack to cool completely. Once cool, frost with vanilla buttercream and sprinkle additional sprinkles onto cake. 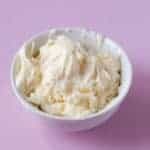 Cream butter until smooth in a medium mixing bowl. Add powdered sugar, milk, vanilla, and almond extract. Mix, on low speed, until smooth. If buttercream seems thick, add a teaspoon or so additional milk. Use as directed. Use a gluten-free flour blend that includes xanthan gum. Bob's Red Mill 1:1 Gluten-Free Baking Flour recommended. If your blend doesn't include xanthan gum, add 1 teaspoon along with the flour. Whisk together. Hi came across your recipe I have only got two 12 inch cake tins. Do I need to double the recipe for the 12 inch cake tins. A 12-inch cake pan is really big. By volume, it takes 7 1/2 cups of batter. An 8-inch pan only uses 3 cups. So, yes, you can double it but the cake will be short. Moist, tender crumb, and absolutely scrumptious! Baked this today for my birthday. I skipped dinner and went straight to dessert. Yum and HAPPY BIRTHDAY to me! Didn’t have vegetable oil so I subbed 4oz applesauce, 8oz heavy whipping cream (whipped), and remainder of liquid portion (oil + milk) by weight with almond milk. Also, had to use up cream cheese so made a cream cheese frosting. So pleased! Will be making this again for sure! Thank you for sharing this recipe. This cake and the icing are easy to make, and delicious! My family loves it. The second time I made it, I used Splenda for the icing, instead of sugar, with no problem. I’m thinking of substituting Splenda for maybe a third or half of the sugar in the cake. Do you think that will still work, texture-wise? Thanks. I’m not sure, to be honest. If you try it use Splenda for Baking. Several readers have had good luck with it.